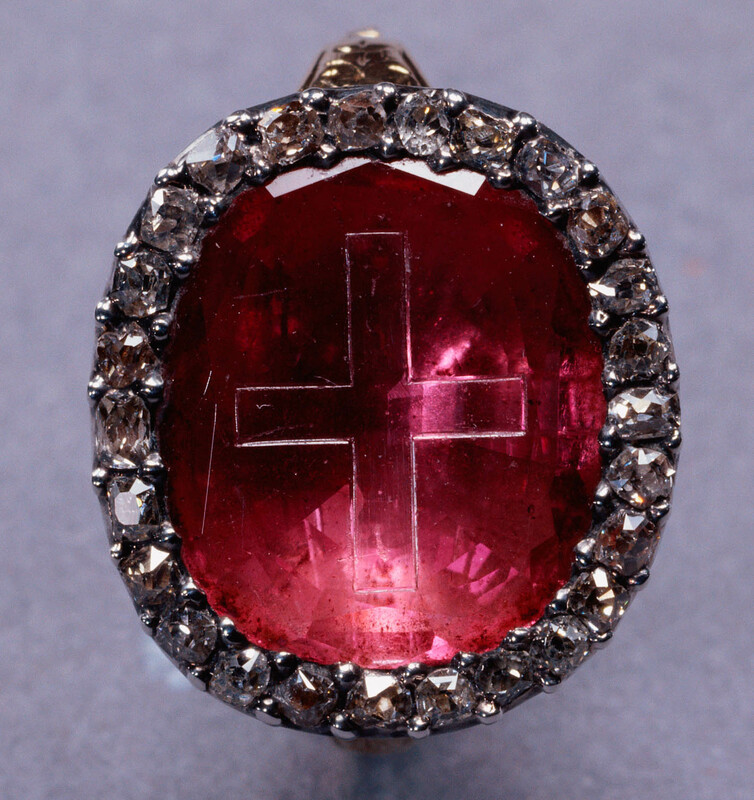 Ruby ring: centre is a large but thin ruby engraved with the cross of St George with foil behind. Ruby surrounded by 26 diamonds set in silver. Head of ring polished gold with engraved scrollwork. Shoulders engraved, adjustable shank. This ring was bequeathed, to George, Prince of Wales, by Henry Benedict, Cardinal York (1725-1807), the younger brother of the Young Pretender, Charles Edward Stuart. It was described in the Cardinal’s will as ‘a ruby ring surrounded by brilliants. On the ruby a cross is engraved. It was used on the coronation day of the Kings of Scotland’. The engraved ruby is from the coronation ring with which James II and VII, the Cardinal’s grandfather, was invested at his coronation in Westminster Abbey on 23 April 1685. In an account of the ceremony the ring is described as ‘being a plain Gold Ring, with a large Table Ruby Violet wherein a plain Cross, or Cross of St. George, was curiously Enchased’. Although the ring was included in a warrant to the Master of the Jewel House dated 19 March 1685 for items to be supplied for the coronation, it is curiously absent from the coronation accounts. This was perhaps because coronation rings were considered the personal property of the sovereign and were paid for privately. Alternatively, James II may have used Charles II’s ring. That ring was included in the warrant of 1660 for coronation regalia to Sir Gilbert Talbot, Master of the Jewel House, but it does not appear in the warrant for payment to Robert Vyner, Royal goldsmith, nor does it appear in the list of items made for Charles II’s coronation, drawn up for James II’s Coronation Committee in 1685. Sir Edward Walker, Garter King of Arms, sketched the coronation regalia in 1661; his drawing of the ‘Ring with the Ruby’ appears to show a plain stone lacking a cross but Walker’s sketches are not reliable so this does not necessarily preclude the possibility that James II used his brother’s ring. The practice of investing the sovereign with a ring on the fourth finger of the right hand, following the crowning but before receiving the sceptre, was continued after the Restoration. A contemporary description relates how, during the coronation of James II, the Archbishop of Canterbury put the ring ‘on the fourth finger of His Majesties right hand, saying, Receive the ring of Kingly Dignity and the seal of Catholick Faith, that thou are this day consecrated head and prince of this kingdom and people’. The King was then presented with a richly decorated glove which he wore on his right hand over the ring. The absence of Charles II’s coronation ring from the accounts raises the intriguing possibility that he used his father’s ring. Certainly Cardinal York believed that this ring was Charles I’s: in a letter written to the Cardinal in January 1800, Thomas Coutts recalled how he had afforded the youngest Miss Coutts ‘the distinguished honour’ of putting on ‘the ring which Charles I wore at his Coronation’. The ring was ambiguously described as ‘King Charles’s Coronation Ring’ when it was listed at Windsor Castle in 1830. James II took his coronation ring with him into exile in 1688. It is listed in his posthumous inventory drawn up at Saint-Germain on 20 July 1703 as ‘One Ruby Ring having a Cross ingraved on it wth which the Late King was crowned’. In 1715 the ring was included in an inventory of the goods of his widow, Mary of Modena, dispatched from Paris . Following her death in 1718, the ring appears to have remained with the exiled Stuarts until it was bequeathed in the will of Cardinal York to the Prince of Wales in 1807. The Prince received other bequests: the Sobieski Hours, a fifteenth century Book of Hours which is in the Royal Library at Windsor, and a badge of the Order of the Thistle. After remaining hidden in Italy, at considerable risk to their keepers from the occupying French, the pieces were finally delivered to the Prince Regent at Carlton House in June 1815. The thin flat-cut ruby is probably one half of a medieval bead that has been cut away and polished to remove the drill hole. The engraved cross is probably seventeenth century. The border of brilliants is a later addition, first referred to in Cardinal York’s will; the type of setting supporting the brilliants was in use by 1780. The style and workmanship of the remainder of the ring suggest that it was extensively remodelled for the Prince Regent in the early nineteenth century. In 1830 William IV deposited the ring on loan to be displayed with the Honours of Scotland in Edinburgh Castle.